Last night I played my first show in Brisbane this year at The Waiting Room, as one of the supports for the Bremen Town Musician album launch. A really enjoyable night of music, with great sets from Bremen Town Musician, Secret Black and Cedie Janson. Had a good time playing, incorporating some new ideas and a re-work of some music I contributed towards the new Bremen Town musician album. Thanks to all! 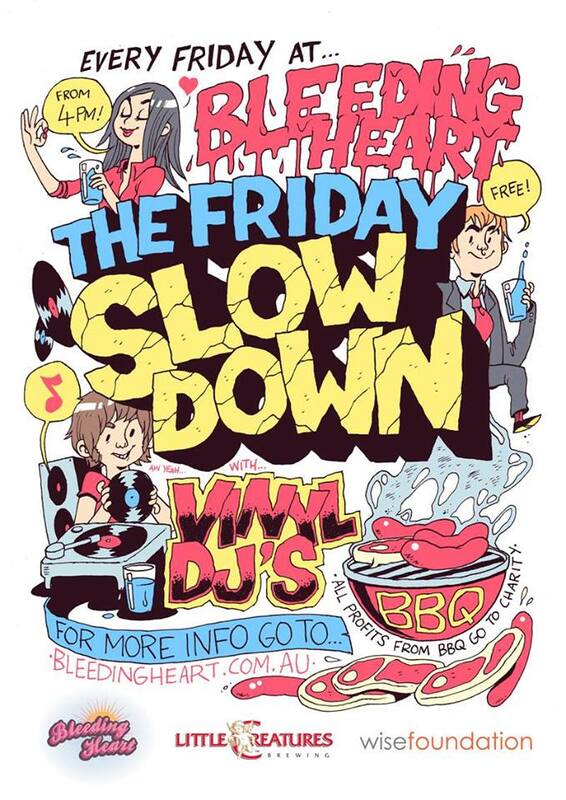 Next up, in a couple of weeks, is an all-vinyl DJ set with Brendan Telford (Sonic Masala) as part of the excellent Friday Slow Down series at Bleeding Heart Gallery in Brisbane. Free entry, perfect way to start the weekend. Even better, all your (well priced) drinks and food money goes towards charity. Hooray! Brendan and I will go back and forth playing a bunch of music that is interesting *and* palatable – I better leave the novelty records and noise albums at home. Obviously this narrows down things a little. Did you know I have a bandcamp site where you can pay for my music so I can buy records to play in public? Sure you did. Here’s a 2014 reminder!